It is massively larger than 11 million illegals. Hans Rosling, co-founder of Gapminder, calls it “the biggest change of our time”. It is Africa’s population growth from 1 billion people today to 2.5 billion by 2050 and 4 billion by 2100. You could say that a close “second biggest change of our time” is the aging and stagnation of the population in rich countries. The combined population of North America, Europe, Japan and Australia/New Zealand is now at 1.3 billion and it will remain at 1.3 billion by 2050 and 2100 with small gains in North America and Oceania offset by declines in Europe and Japan. This boom and bust present an unprecedented challenge to policy makers in every country of the world. Poor countries in Africa and Asia are ill-prepared for a boom that will last for decades. And rich countries must adapt their economies to a new reality of flat or falling domestic demand. In addition, the West also faces an increased flow of migrants from Africa and the Middle East fleeing poverty or war. If a candidate wishes to seriously address the demographic emergency, he might turn his attention to the much larger global picture, not just what happens at the US-Mexico border. Without an improvement in local conditions in Africa and Asia, millions will try to move to the West. The numbers we now see crossing the Mediterranean at great risk will pale in comparison to those of twenty or thirty years from now. In the same week that Donald Trump announced his immigration plan, there was news that Germany could accept as many as 750,000 refugees this year. If they end up remaining in Germany, this would amount to 0.9% of the German population, a higher annual rate of immigration than the US has had in over a century. By way of comparison, the current US rate is at 1 million green cards per year, equal to 0.3% of the US population. The post war average is 0.25% per year. The migrant crisis is putting Europe’s openness to the test. Not all countries are as welcoming. Sweden is more open than others and has been accepting the equivalent of 1%+ of its population every year. Other countries only agree to take in very small numbers or reserve the right to be selective. Of course, it is not as easy to move from Africa to North America. The Atlantic and Pacific Oceans will deter millions of desperate migrants who will instead try their luck with Europe. In fact, barring the unexpected, the Western hemisphere is relatively insulated from this century’s population boom. On current UN projections, the population of North and South America will rise by a relatively modest 225 million between now and 2050, less than 10% of the entire 2.4 billion rise in world population. Nonetheless we can assume that some millions, or perhaps tens of millions, out of a few billions, will find their way across the oceans. This chart shows the scale of the expected changes. The first bar on the left, nearly invisible, is the current population of illegal immigrants in the US, estimated at 10 to 15 million. The next one, barely visible, are the future legal immigrants into the US between today and 2050 assuming the current run rate of 1 million per year. The next four bars are the increases in populations for the US, the Western hemisphere, Africa and the world in the next 35 years. So you can see that our domestic concerns are minute in comparison to what is happening elsewhere in the world. It is true that close proximity to a crisis creates a greater sense of urgency. A small problem next door can be more pressing than a large problem a thousand miles away. Developed countries including the US, Canada, Europe, Japan, Australia, New Zealand are having fewer children than in the past. Their total fertility ratios (TFR) are below the replacement level of 2.1 average children per woman. This means that the populations of these countries are shrinking (Japan, Germany, Italy), plateauing (Europe in general) or growing slowly (North America, France, Great Britain). According to the latest UN estimate, the US population will increase from 322 million today to 389 million in 2050. This projection includes future immigrants and is equivalent to an annual growth rate of 0.5%, well below the 1.2% average of the last 100 years. The post war average is also 1.2%. Europe’s population will fall from 738 million to 707 million. Russia, Germany and Italy will shrink while France and the UK grow slowly. Several emerging markets including China and Russia also have TFRs below replacement. China’s population will be peaking then falling. It will be surpassed by India’s within the next ten years. All the above mentioned countries except India have aging populations. The median age in the United States is now 38 years and rising. In nearly all European countries, it is over 40. In Germany and Japan, it is 46. At the other end of the spectrum, in booming Nigeria, Ethiopia and Congo, it is less than 20. Dependency ratios (loosely the number of dependents per worker) are rising everywhere except in Sub-Saharan Africa, India and a few other countries. As noted above, the populations of Sub-Saharan Africa and of the Indian subcontinent (India, Pakistan, Bangladesh) are booming. Sub-Saharan Africa is estimated to grow from 962m today to 2.1 billion in 2050. India from 1.3 billion to 1.7 billion. And the world population is expected to grow by 2.4 billion additional people by 2050. But the Western hemisphere is expected to add only 225 million, less than 10% of the projected increase. One of Mr. Trump’s proposals is to build a wall along the Mexican border. Beyond the near term, this may or may not prove effective. Certainly, the Southern border as it stands today is one of the softest points of entry for current and future illegal immigrants. It is morally right that every child should be given the best chance to survive, eat well, stay healthy, and receive an education. Now we also know that it is among the best investments we can make. Healthy, well-educated kids grow into productive adults, capable of providing a better future for their own children, creating a virtuous circle that can help build a better, more prosperous world. Our own work at populyst centers on the development of the populyst index™ which rates each country on three measures: innovation/productivity, demographics/health care, and institutional strength/governance. In recent years, the deteriorating demographics of the West have eroded their standing in the index. And the booming demographics of poor countries have given them an opportunity to make significant strides if they can implement the needed reforms. Emerging economies would benefit from western capital, technology and institutional expertise. Better health care in Africa and India would lower infant mortality, improve women’s health and accelerate the fall in TFRs, curbing the big population boom. Domestic demand is slackening in rich countries and would benefit from new sources of demand from rising populations. A rising standard of living in poor countries will add to the revenues of Western firms dealing with sluggish home markets. An improvement in emerging economies would relieve the migrant crisis we are now seeing in the Mediterranean and Europe. 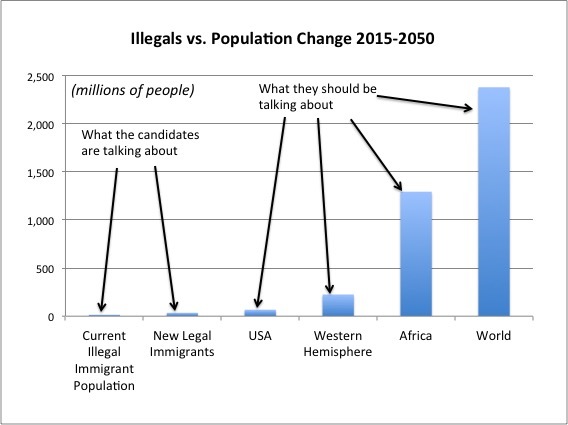 In case of inaction, the political instability and economic dislocation the world may suffer because of the ongoing population boom will touch our own country in more undesirable ways than a few million unwanted immigrants have done so far. 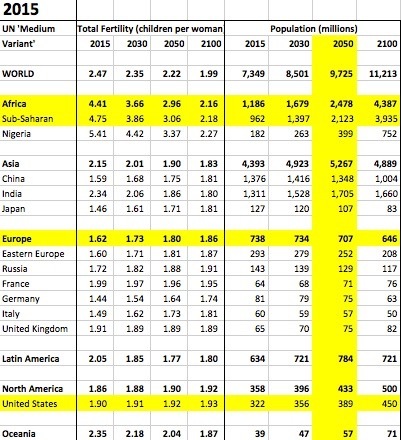 How do we respond to the twin problem of stagnant demographics in the West and booming demographics in poor countries? This is the question that all candidates should be debating.